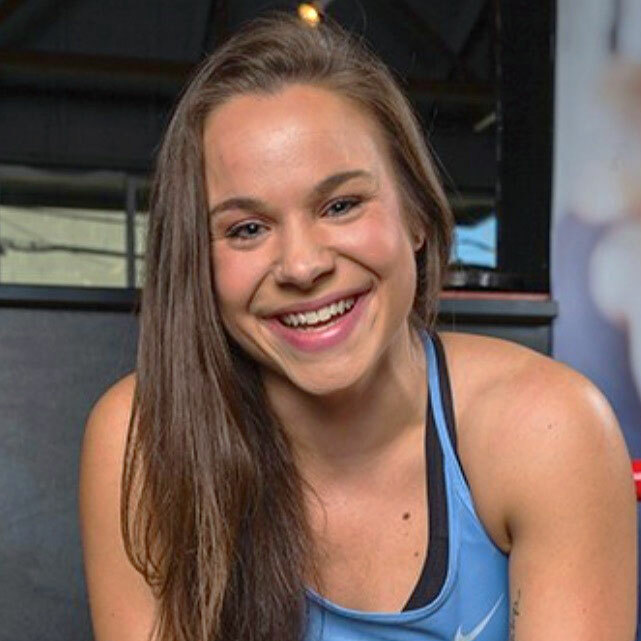 Amy, a young woman from Nashville has a soft spot for sarcasm, coffee, and fitness. A few years ago, she discovered her love for boxing, almost by accident. Here is her story. Any Sport Activity Used To Be My Living Nightmare! My name is Amy Bream, and I was born with a birth defect which caused me to be born without my right leg. Because of that, I’ve never considered myself an athletic person. Obviously missing a limb can hinder the likelihood of me being a sports rockstar. Still, prosthetic leg aside, I’ve never been the most coordinated human being you’ll ever meet, so things like gym class, field day, and really any sport activity was my living nightmare throughout grade school. In recent years I’ve started to challenge myself to try different physical activities more than ever before. I used to be way more self-conscious about my leg, but over time I realized the more I tried, the less fearful I was. Eventually I even started to enjoy giving myself new challenges. About three years ago, a friend of mine told me about this boxing gym. Apparently, the gym was offering some kind of special membership price, and it would be the perfect time to check it out if I was interested. My first reaction was to laugh. Me, try boxing? Yeah, okay. I kept replaying scenes from the Rocky movies in my head. No matter how many times I tried, I could never successfully imagine myself completing any of those workouts. Still though, my friend kept mentioning it, and my curiosity and competitive nature got the best of me. I decided I’d try it out, and as long as I didn’t die in the process, I’d join for a bit. So, long story short, I became a member of a TITLE Boxing Club. To think back on that first boxing class still makes me laugh. I must have looked ridiculous. To even attempt to say I had good boxing technique from the get-go is a blatant lie. I had never experienced a workout like that, and I was literally drenched in sweat by the end. (As in, I looked like I had just taken a shower. But no no, it was just sweat.) Regardless, I was hooked, and knew instantly I wanted to come back and try it again the next day. So, why do I enjoy boxing so much? Well for starters, it’s a great workout. Let’s be clear, I’m not going to a grunge gym you see in movies with old men yelling at you in the corner to work harder. TITLE is a group fitness gym that teaches boxing technique. With that said, I’m competitive and personally feed off of other people’s energy, so when I’m in a class setting and a trainer or someone next to me challenges me to do more, I do more. On a deeper level, boxing has pushed me to my limits in more ways than one. I’ve had to overcome mental and emotional obstacles as well as physical. A lot of boxing is in your legs. Did you know that? Obviously your arms throw the punches, but the power behind each punch comes from your core and legs. When I first started at TITLE, I felt self-conscious every time I heard a trainer say that. I also assumed my technique would never be correct because of that, and there would always be certain moves I couldn’t do. The more I went, though, the more trainers noticed I didn’t mind getting pushed to do better. Eventually a few of them gave me constructive criticism on my technique, and they even worked with me to adjust the move or exercise as needed. The most amazing part in all of this is that I’ve learned my body is capable of way more than I ever gave it credit for. Turns out my boxing technique doesn’t have to look terrible. Through patience and a whole lot of practice, I’ve improved. I’m still in the process of improving (that journey never ends), and through it all I’m learning how to use and trust my prosthesis better when I exercise more than I ever have before. Heck, I’m kickboxing now. Kickboxing. I couldn’t have dreamed that up three years ago if I tried. Boxing gave me a confidence I didn’t know I had in me. It opened my eyes to a world of fitness I love, and it spurred me to continue pushing myself and to even try other workouts I never had the courage to try before. Yeah, it helped get me in shape - blah blah blah. But more importantly, it showed me that my prosthesis doesn’t stop me from living life. It’s meant to help serve me in whatever lifestyle I choose. If you are reading this and have made it this far (let’s be real, I’m long-winded), don’t feel that you have to go join a boxing gym. Heck, you may hate the idea of boxing – it’s not for everyone, and that’s okay. If you take away anything from this blog, let it be this: nothing and no one defines your physical limits more than you do. If you want to try something, don’t let fear stop you. The best way to get over fear is to face it, not just once, but over and over again. Eventually that mountain you’re trying to climb doesn’t seem so impossible, and before you know it you’re halfway up it and having a blast. Guest post by Amy Bream. Amy is 26 years old, grew up in a small town in Pennsylvania and moved to Nashville almost four years ago. She is the youngest of four kids in her family, and a few of her favorite things are sarcasm, coffee, and fitness. She also happened to be born with one leg, and she has decided to share her story with anyone who wants to listen! Amy has a fantastic blog and you can follow her on Instagram and Facebook.